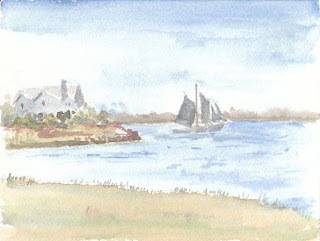 A little plein aire watercolor done at the end of Pitt Street in Mount Pleasant. Caught a huge sailboat as it was headed into the harbor. 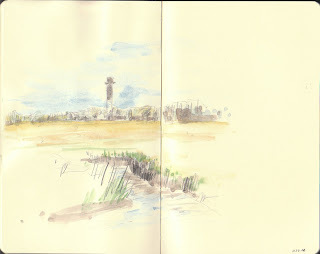 Below is a sketch of the Sullivan's Island Lighthouse. These two are fabulous! I especially love the Pitt Street watercolor. Are you doing these on Moleskin notebooks? Thanks! The top one is on a small (maybe 4x6) piece of watercolor paper - the bottom one is in one of the large moleskines. I learned a little bookbinding and make my own sketchbooks now (am I compulsive - yes), but use a small moleskine for quickie sketches.